This photo is quite recent actually...haha... i am in Egypt!! Can u see the Pyramid of Giza? Actually quite interesting lah... but sad to say, no shopping! Everyday Temple or Museum.... i hate history man.... going to fall asleep le... zzz.... But i lurfe the pyramid!! Its nice!!! Wow!!! This photo was taken at the airport... managed to make a few frens in the same tour grp as me... haha... am i sociable? heehee... i am the youngest among them!!! Haha... everyone is so friendly and nice!!! 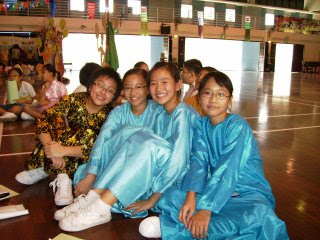 This picture was taken on Racial Harmony Day.. The last Racial Harmony Day i have in Da Qiao... Here are my good frens... Candice, Xinyun and Joey... They all very pretty one! haha.... do i look lyk a malay when i am wearing this baju kurung? haha.... So fun.... Should have worn a sari!!! How time flies!!! I am six!! Hah, this is my 6th b'day! The girl in yellow is Wei Ting! Pretty right? 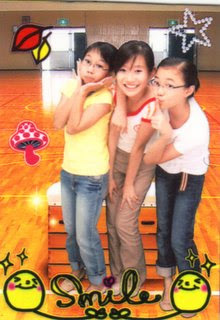 haha.... She is 4 liao.... the girl nxt to me is Jeslyn Loh.... Frens from Da Qiao, u all noe her? she is oso p6, lyk us... we were in the same kindergarten leh.... haha.... she is now in Mayflower Secondary! Again, her mum and my mum are good frens! Yay! Finally graduated frm my kindergarten! Thanks all the teachers there for your care and concern showered on me! U make me soar and stretch! I will not forget all of u! Go, Jolene! Dun let those who care for u down! Jia you!!! This si the first time i am wearing this kind of costume... I want to wear it a second time! I want to graduate frm a University amd wear this thing again! So cool! Haha... I want to study and bcome a lawyer! That is my dream! It seems dat i have to work very hard frm now! Cannot slack one!!! Go Jolene! Strive for excellence! Haha, lets continue wif the pics... Yah this is my 2 year old birthday! The two girls sitting beside me are my cousins... so pretty hor? One is Lynette, now Sec 3 in PLMGS... Haha... dun say anymore le... she very beautiful one leh...oh no, she's goin to scold me ltr... she got her privacy though... Yah, another chio girl is called Angeline... Wah, this one very pretty oso leh... Haha, now she working already!!! So fast hor? heehee....See, i have a chocolate cake... Yummy yummy!!! Kangaroos!!! Aren't they cute? I lurfe them man... so cute... Yah, this was taken when i was four, in Australia, Perth! I enjoyed my trip very much and yah, i went with Wei Ting oso!!! My first b'day! Yippee! So many presents! Wow! I am two years old! Yay! Growing up is such a wonderful process! Yah, i wanna be a doctor when i grow up! I am still crawling!!!!!! Hope dat i can walk one day lyk my mum and dad! Go, go, go! Haha... so sweet!!! YAY!!! I am finally turning one! Haha... LOL!!! At the Toy Shop! So naughty looking huh? greetings yesterday.... It was my birthday yesterday!!haha... Valentines' Day! lol... thanks all my dear frens, u all have spent so much money! Anyway, its the thought dat counts lah... Tell u all hor... the ppl who is guilty of making me cry are : Candice, Su Fen and of coz the whole of 1A! Go, 1 Awesome Acorns! Haha, here is the pic when i first step into this world.... 14 February 1994, 2.24pm.... i stepped into this world, full of curiosity... Haha, look at my photo, is it adorable? LOL....This year, i really had a very enjoyable b'day! Thx, my pals! I lurfe u all! Thirteen years have passed in the twinkling of an eye... that's so fast! Isn't it? In this thirteen yrs, I've really gone through a lot... happiness, sadness etc. I think we should not be killing time here on Earth... we should treasure everything around us and not take things for granted! Yah, we should live life to the fullest from now on! Go Jolene! Haha, yesterday i learnt a new phrase: " lame duck". Haha, i very 'toot' hor? Anyway, Happy Belated Birthday, Jolene! Blow the candles! U may ask me wats my birthday wish...but so sorry, i am not telling u! A lot of first times happened there... It was the first time I really felt proud of myself... It was the first time I took part in a National exam... It was the first time i took my BCG.... It was the first time i had crush on someone...lol.... It was the first time i failed terribly.... It was oso the first time i went on stage to perform... It was the first time i had really great frens lyk Su Fen, Suzann, Candice, Xin Yun, Melissa amd Joey... they stood by me through thick and thin... though friction would sometimes happen btw us... but i hope we can be frens 4eva! Cheers! Those frm 6 Ruby, still rmb how terribly i cried when i had my BCG? Thanks everyone hu cheered me up and comforted me... (Especially Joey and Yi Yan) I rmd dat time i was so scared... I was shivering... Melissa still tell me not pain one... so pain lor... Haha.... Recalling this back, i think i am really so timid! Anyway, DQPS will always be deep in my heart! PS. I was crying while typing this! Not lying!!! This week hor, nothing much happen actually... i got something to tell Candice though.... Candice, Happy Belated Birthday! May u stay happy everyday! Sorry hor..ur present Xin Yun and I will give u when we see u! Touched?